This entry was tagged bedtime, rocking chair, sleep. Bookmark the permalink. I’m not sure what I like more…you rocking sweet Henry, your wonderful words about what a joy it is to rock him to sleep, or that fabulous poster of the Red Head from Wyoming in the back ground! Love seeing a piece of your world. Miss you and love you all! The picture was a wedding gift from Mark on our first anniversary, neat, huh? Miss you too, hope you can meet the boy soon. kinda looks from the lighting that you are trying to pull one over on him and put him to bed at 4:40 in the afternoon. Maybe he is unfoolable. Mom used to try to make us go to bed while we could still hear all our friends playing outside in the summer, remember? broad daylight. I probably enjoyed that. I always did like to get to bed early. I love my incredibly large feet. Somehow I forget how big they are. 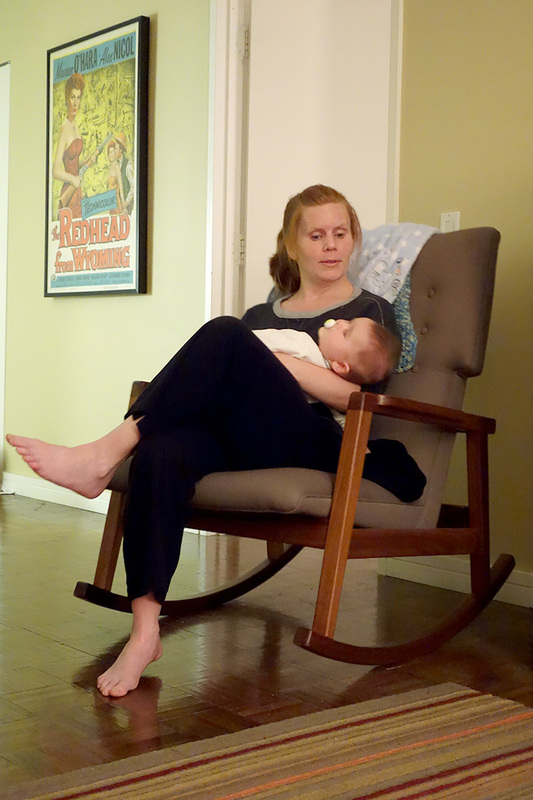 How sweet these photos are of Jacqui rocking Henry to sleep. She’s a terrific Mom ! PS – I, too, loved the Red Head from Wyoming poster when I saw it last October. A perfect gift for Jacqui !